It was in 1889 that the newly created London County Council began formulating plans to widen the Strand and set about the biggest clearance London has ever seen since the great fire of 1666. Eight acres of streets and buildings were to go to make way for the crescent called the Aldwych at the end of the new road to Holborn called Kingsway. No one followed the redevelopment plans for the area with greater interest than Edward George Saunders, manager of the small Coronet Theatre at Notting Hill Gate, who had great ambitions to have his own theatre. Among the theatregoers with whom he became friendly was Thomas Frederick Wild, a chartered accountant. 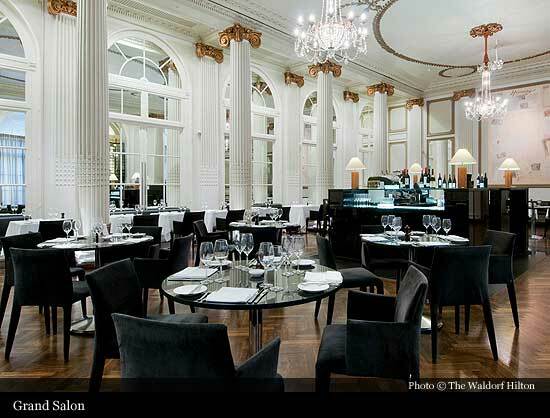 Saunders told Wild about an idea he had for a new theatre in Aldwych and though later Saunders was to claim an hotel was his idea as well, it seems certain that it was Wild who added the hotel to the plans. 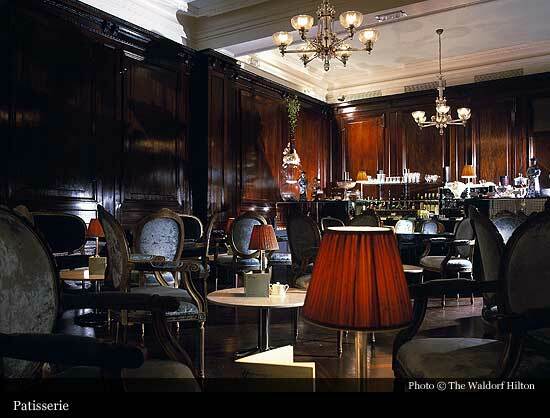 The name Saunders and Wild chose for their company, theatre and hotel seemed to imply there was Astor money involved. Rumours to this effect still persist. In fact, the name seems simply to be the one they picked because it had a ring of class, money and hotels, for at that time, William Waldorf Astor, who had just become a naturalised British subject, was the richest man in the world. 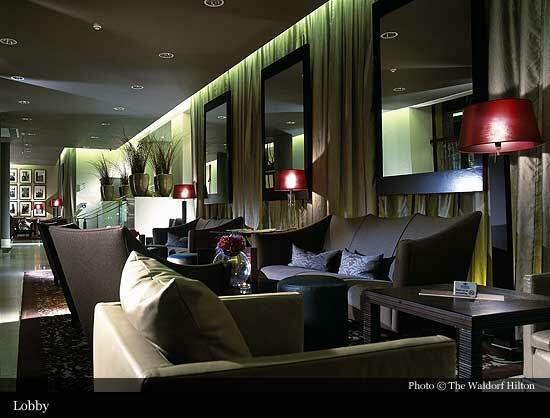 If the name was synonymous with hotels and success it did not work out that way at first for the partners. They had signed up a famous architect, Alexander Marshall Mackenzie of Aberdeen, to design a hotel with 12 small shops beneath. Shares in the syndicate did not go too well and Saunders dream of a theatre began to crumble when two theatres were started on each side of their site. The Waldorf Theatre did eventually open on the corner of Catherine Street. Marshall Mackenzie had seen all the latest hotels in the United States and had picked up many useful ideas including putting in a much higher ratio of bathrooms to bedrooms than was usual in Britain. 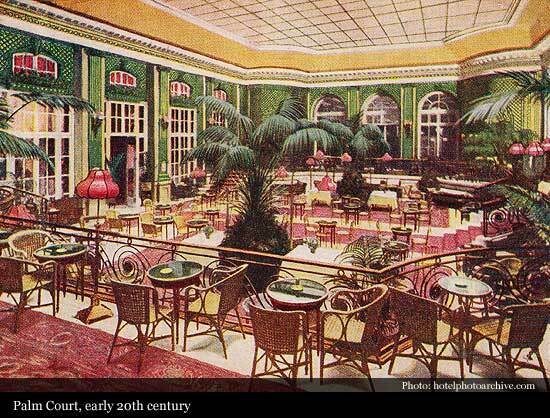 He was determined that the Waldorf was to be the finest of its time and he planned three entrance halls, the middle one opening on to the Palm Court lounge. The result was a majestic example of Edwardian building and it bought Marshall Mackenzie a great deal of praise. The respected ‘Architectural Review’ went so far as to call the hotel a ‘dignified architectural note in the improved heart of London’. The ‘Morning Post’ of Tuesday, January 28, 1908, having had a review before the official opening that evening, positively gushed to it’s readers. “Once inside attention is immediately riveted on the spacious Palm Court – a glass covered courtyard treated as a garden, with a marble terrace around decked with light trellis work of a pattern and colour [it was pale green and white] more restful on the eye”. 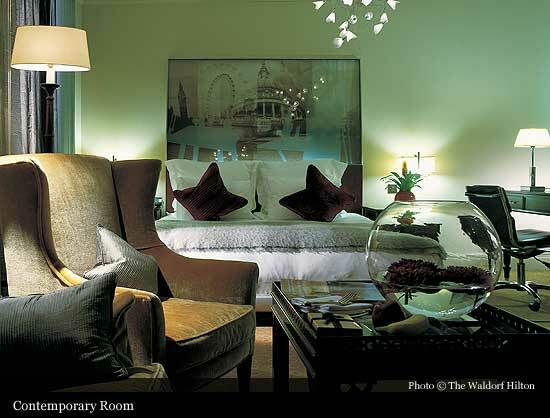 The hotel was built with 400 bedrooms, 176 bathrooms, several of the rooms were arranged as small flats with sitting rooms, bedrooms and bathrooms. The grill room, restaurant and Masonic temple rooms were located in the basement. 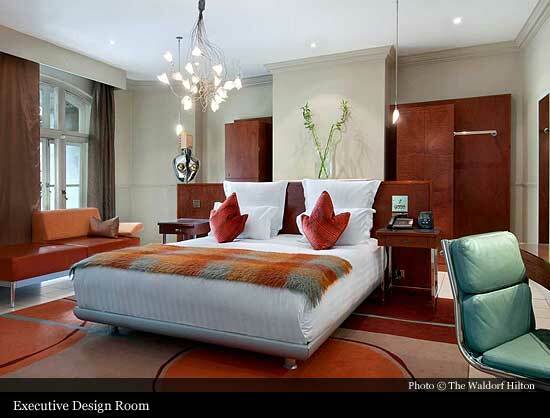 It was all very modern and the hotel had everything, even electric light operated from the bedside. Every room had a telephone and there was a telephone exchange, which was previously unheard of. 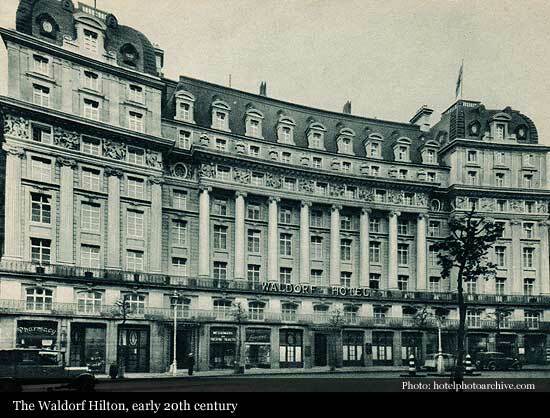 The public rooms were two storeys high, the intermediate floor housed a billiards room, the ladies’ drawing room and suites of private sitting rooms with windows opening on to a balcony overlooking the Aldwych. Two passenger lifts ran from the basement to the roof. 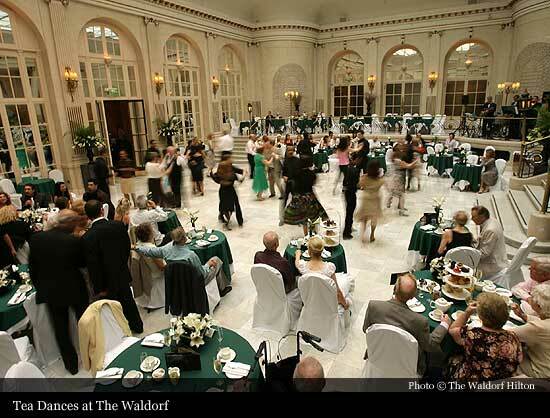 Dancing and the tango in the 1920’s were to become the trademark of the Waldorf, which saw the introduction of special Tango Teas to the restaurant. In 1926, when evening dress was obligatory in the ballroom, dancing became even more popular at the Waldorf when a new, handsome young bandleader took over. Howard Godfrey had already made many broadcasts with his own orchestra and ‘Howard Godfrey and the Waldorfians’ became famous, rivalling the band of Debroy Summers and the Savoy Orpheans round the corner. 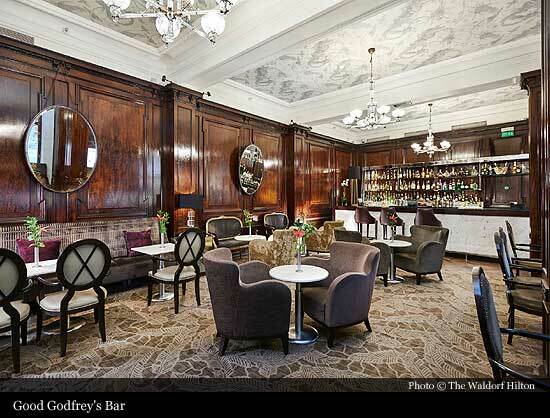 The greatest tragedy for the Waldorf came during the Second World War when, in the afternoon of June 30, 1944, a flying bomb fell at the corner of Aldwych and Kingsway. The explosion crumpled two packed double decker-buses outside the hotel and staff rushed out to help the injured. 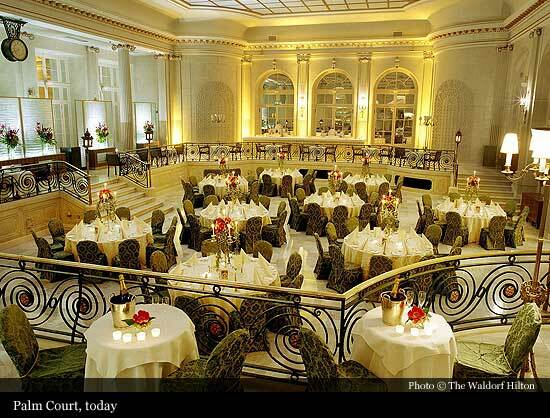 But at the war’s end the Waldorf once again played host to celebrating crowds who packed the streets on both VE Day and VJ Day. After that it was a case of trying to restore business as usual during the difficult years of post-war austerity. Despite the efforts of Frederick Hotels Ltd, by then owners of the hotel and freehold site, the war had taken a lot of the gloss off its former glory. Not for the first time the Waldorf needed a white knight and he appeared in the form of Charles Forte, who later became Lord Forte of Ripley. 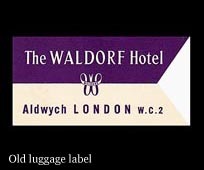 In 1959 the Waldorf became the first of what was to come the over 800-strong hotel empire operated by Forte Plc. During the 1960’s and 1970’s the hotel went from strength to strength and in 1992 the hotel was closed and underwent a refurbishment that cost £12.5m. The hotel re-opened on its 85th anniversary in 1993. 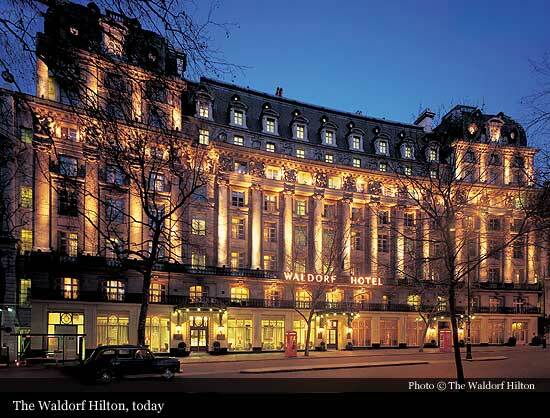 Hilton Hotels was awarded the management contract of the Waldorf Hotel on 5 January 2004 and a £35 million investment programme incorporating all guest rooms, public areas and a brand new F&B concept was completed in December 2004.